Greens mining spokesperson Jeremy Buckingham called for an independent investigation after an AGL coal seam gas well drilled in the South Western Sydney suburb of Menangle Park, only 40 metres from the Nepean River, was flooded on Tuesday, with escaping gas clearly visible bubbling through flood water in the vicinity of the gas well. 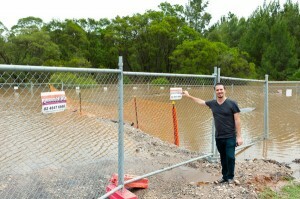 “Despite clear warnings from Campbelltown Council about locating this gas well in a flood zone and endangering the health of the river, the O’Farrell Government recklessly approved a coal seam gas well only 40 metres from the banks of Nepean River in July 2012,” said Greens MP Jeremy Buckingham. “The coal seam gas well pad has been inundated with water, potentially polluting the Nepean River when a minor flood peaked just below six metres around Noon on Tuesday after heavy rain earlier this week. “Chemicals and pollutants from the gas well site have now been washed into the Nepean and Hawkesbury River system by the flood. The flood also revealed that drilling or fracking for coal seam gas seems to have cracked the ground and caused gas to bubble up and leak into the atmosphere – clearly visible on the video footage. “The Greens call on the government to establish an independent investigation into the incident. It is not good enough for AGL to investigate itself given their poor record and the deep mistrust in the community. “This incident shows yet again why coal seam gas mining should be prohibited in Sydney’s suburbs and water catchment. “Common sense would tell you that a toxic industry in such a location is irresponsible and risky, and now we have dangerous chemicals and gases polluting the Nepean River and the suburbs of south west Sydney. “Will the chemicals released from this flooded gas well will go downstream and end up in drinking water of North Richmond and in the Oysters of the Hawkesbury? AGL should be subjected to a huge fine for polluting the Nepean river. Coal seam gas wells and fracking should not be allowed in NSW especially not near our rivers and drinking water. Btw I think Jeremy should have worn a gas mask while standing that close to escaping gas.